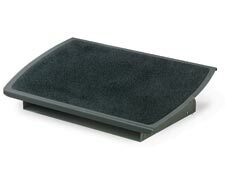 Adjustable Foot Rests Reduce strain and fatigue on legs, back and neck. Both models offer easy foot-controlled platform tilt adjustment and lifetime warranty to original purchaser.Adjustable Foot Rests. Extra-wide 22" platform provides ample space for both feet. Height and tilt adjustable. Heavy-duty steel construction for extra stability. 3M Safety Walk Slip-Resistant Surface keeps feet from sliding. Lifetime warranty.